Thirty four years ago I started my nursery, but I needed a full-time job to help get the ball rolling, and to keep up payments on the farm mortgage. I was newly married and children quickly appeared, so I was forced to become ultra-responsible and enterprising. I had about six previous years of nursery experience working for others – too few in hindsight – but I possessed enormous energy and optimism, the kind of attributes that (used to) define America. I always tried to produce more than what was on order so I wouldn't have to short anyone, and also so I would have some to grow on to larger size. Business was good, and by the 1990's I received orders for over 15,000 'Bloodgood' alone. My shoebox system was perfect because I did it myself, but eventually I was told to give up with the pencil and paper, that a computer was much more efficient. I was dubious because I didn't know anything about computers, and those I employed turned out to be highly inefficient, plus we were dealing with crappy software. That has all changed for the better and I am now very proud of our office employees, website, order and invoicing program and propagation records. I probably wouldn't be in business today with our old office staff. For our specimen sales I recently asked Seth to print a report, which amounts to about 60 pages. It lists the plants by size, the price, the location, how many were listed for sale, number sold and what is still available. 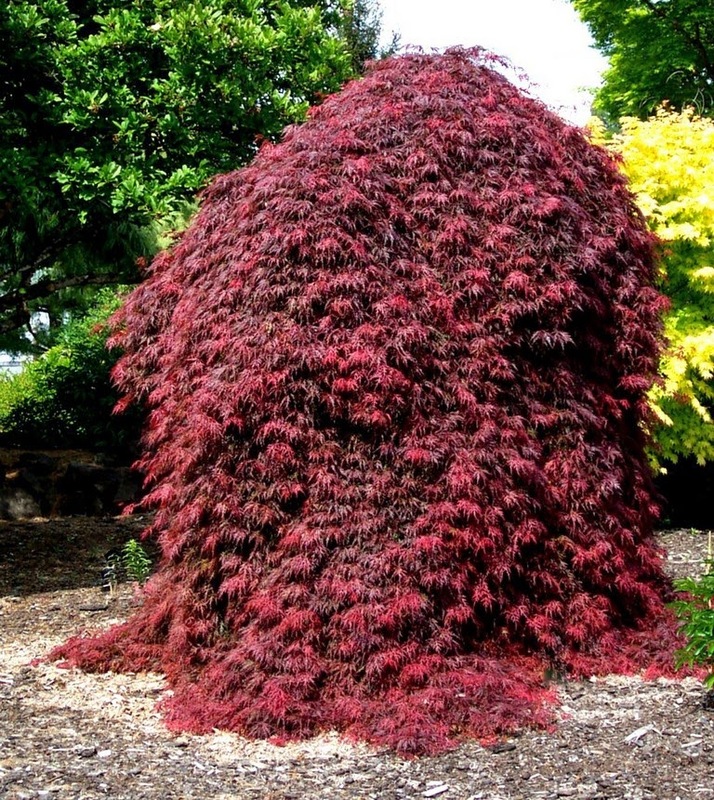 For Acer palmatum 'Hubbs Red Willow' #7 size, we listed 40 and sold 40 for $66 apiece. 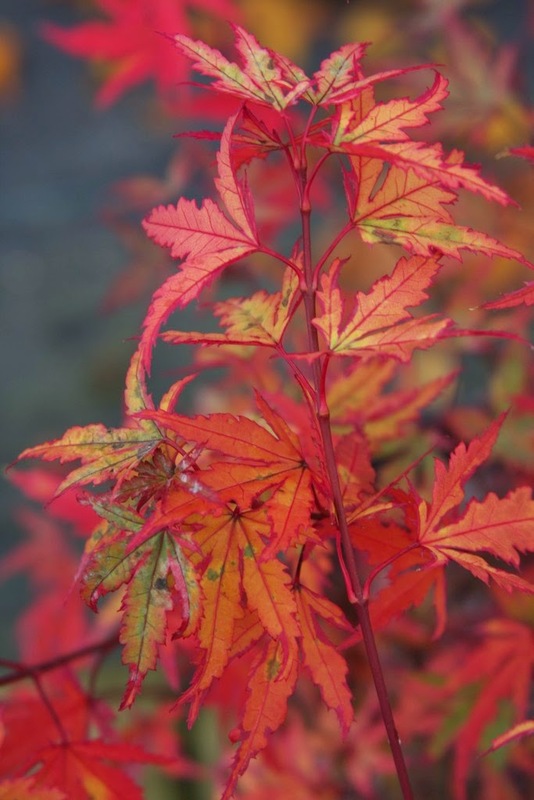 For Acer palmatum 'Orangeola', 24 20" square boxes were listed, 18 have sold with 6 more available. At this point in the year I am impressed with so many zeroes in the available column. 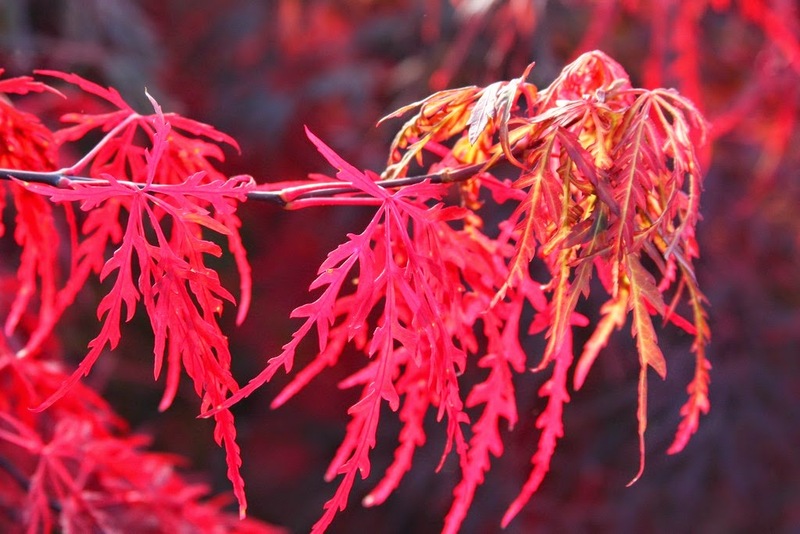 In general, the deciduous plants – Acer, Magnolia, Cornus etc. – feature more sold outs than with the conifers. 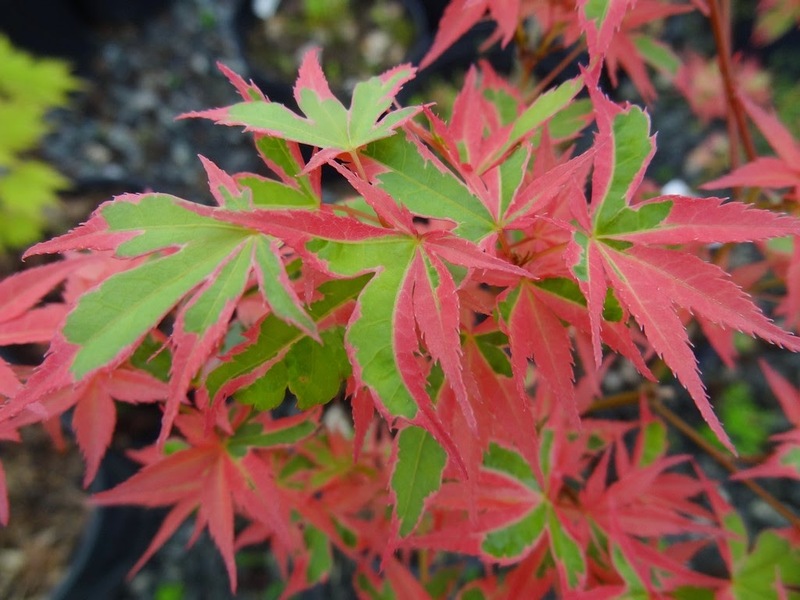 I am not surprised that we have zero availability on Acer palmatum 'Shojo no mai' at any size. 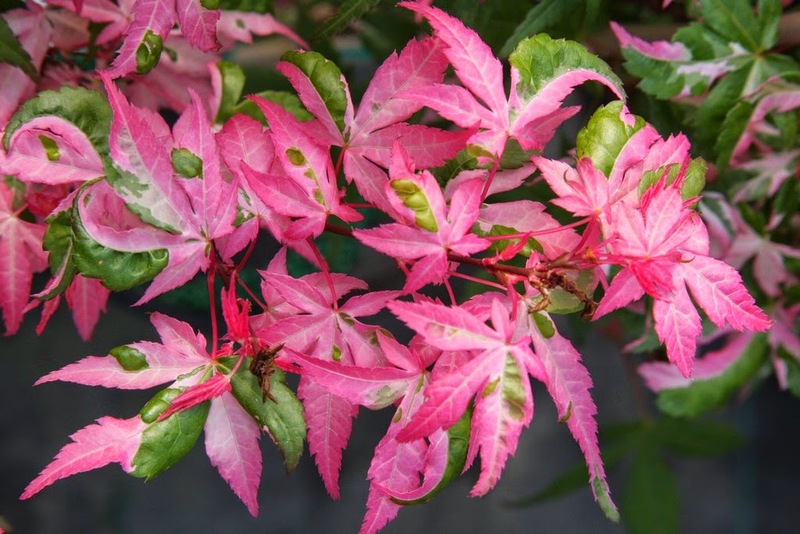 It is a pretty upright tree with pink variegation on small green leaves, and in fact its Japanese name means "dancing red-faced monkey." 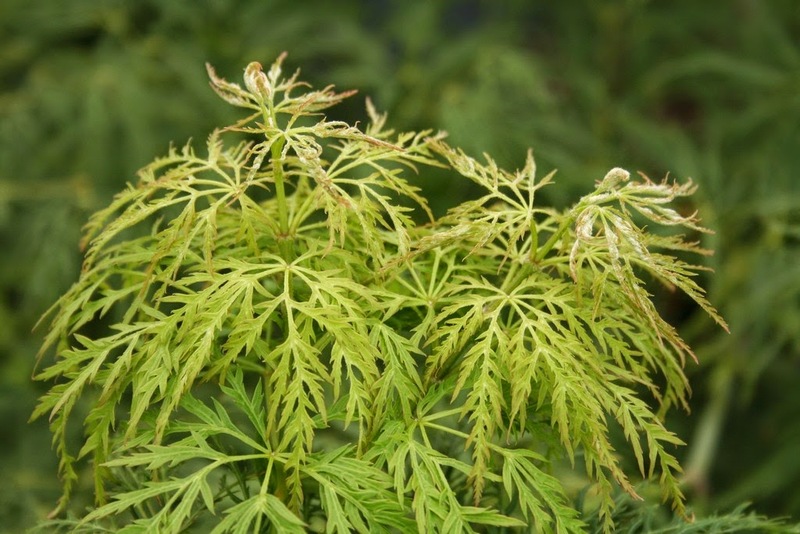 So far I have never seen one revert, and in my opinion it is far superior to the old 'Butterfly' cultivar that used to be everyone's idea of a variegated palmatum. 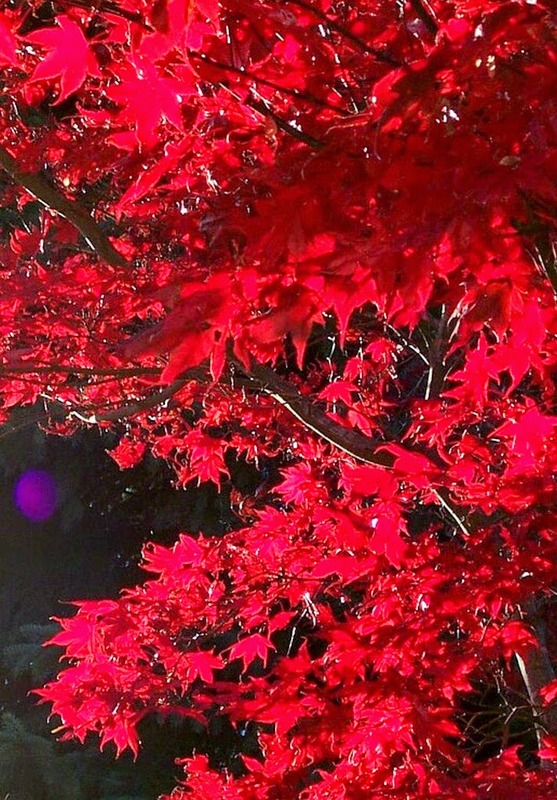 As you can see from the photo above, fall color is mostly orange, but some leaves turn to deep pink. 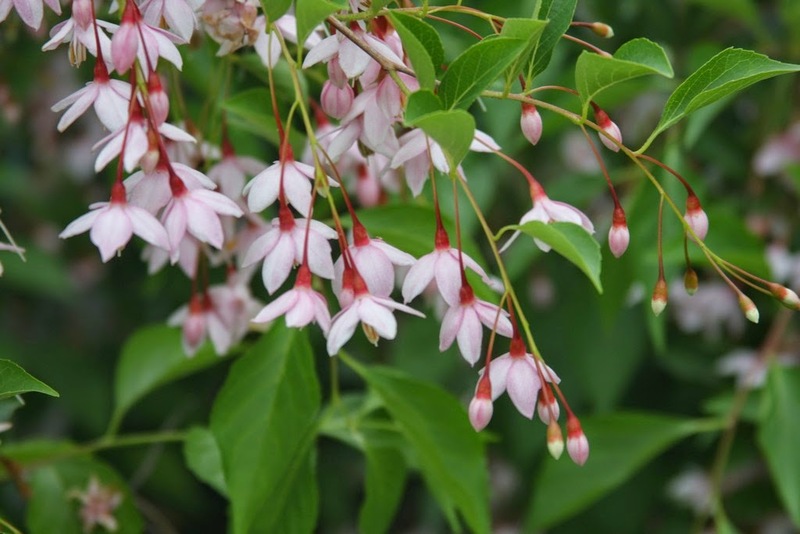 I don't know if 'Shojo no mai' originated as a branch mutation or as a seedling, but it was found and named by Raraflora Nursery in Pennsylvania. 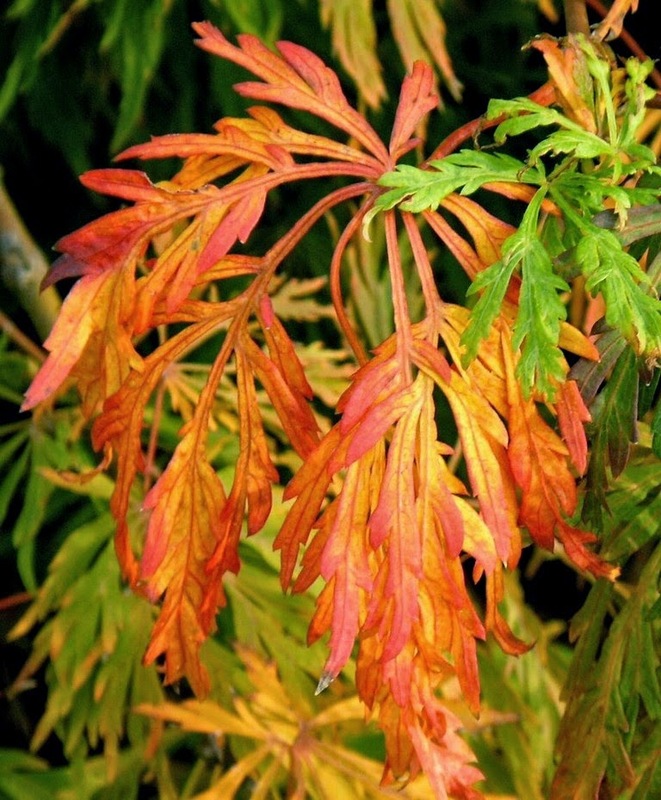 We have no more Acer japonicum 'Abby's Weeping' for sale this season, and we're nearly out of japonicum 'Green Cascade' as well. Neither of these two cultivars are really "weepers," and I would rather describe them as "sprawlers," with long new shoots that arch downward. The leaves of both of these dissectums are basically shaped the same, except that 'Abby's Weeping' is somewhat smaller. 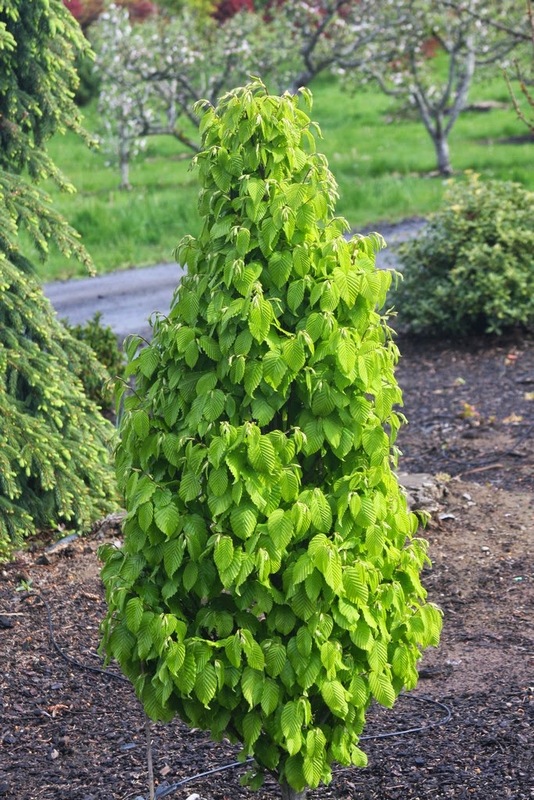 'Green Cascade' can reach enormous size – to 8' tall by 16' wide – whereas 'Abby's Weeping' is lower and more compact. 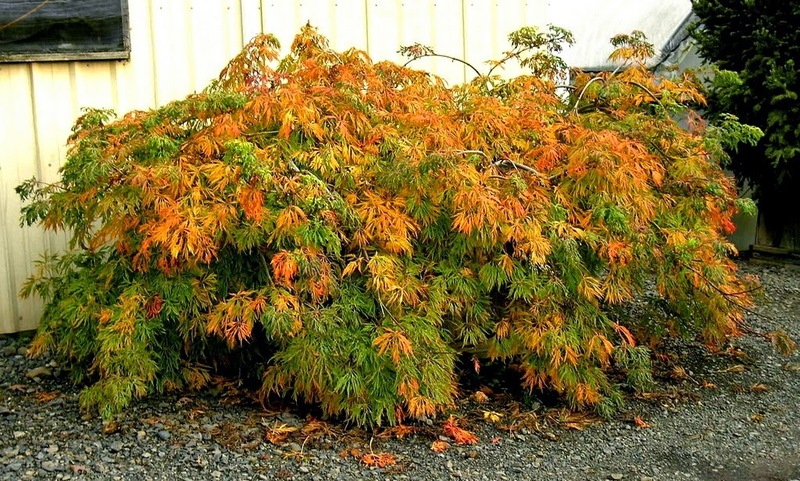 Fall color for 'Green Cascade' ranges from yellow-to-orange-to-red, but I have never seen 'Abby's Weeping' other than deep purple-red. 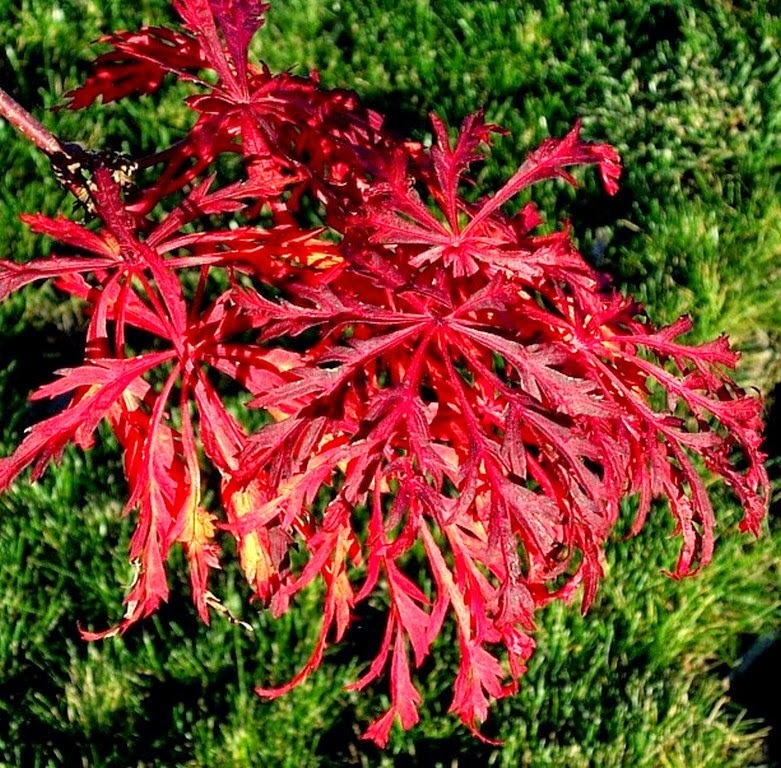 Our introduction of japonicum 'Ao jutan' matches the vigor and fall color of 'Green Cascade', and its leaves are larger and more deeply dissected. 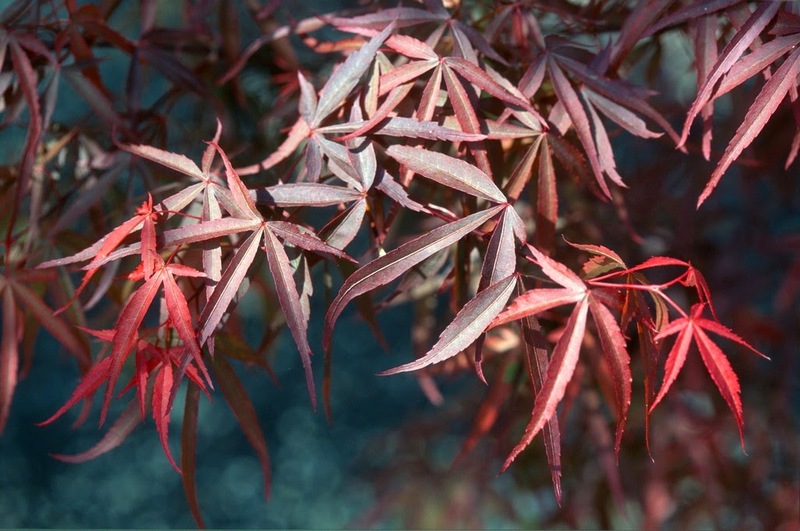 'Ao jutan' – which means "green and spreading" – was selected by the late Edsal Wood of Oregon as a seedling from 'Aconitifolium'. Mr. Wood was one of the most generous of all plantsmen, and I fondly recall the twinkle in his eye when he gave me a plant "to try." 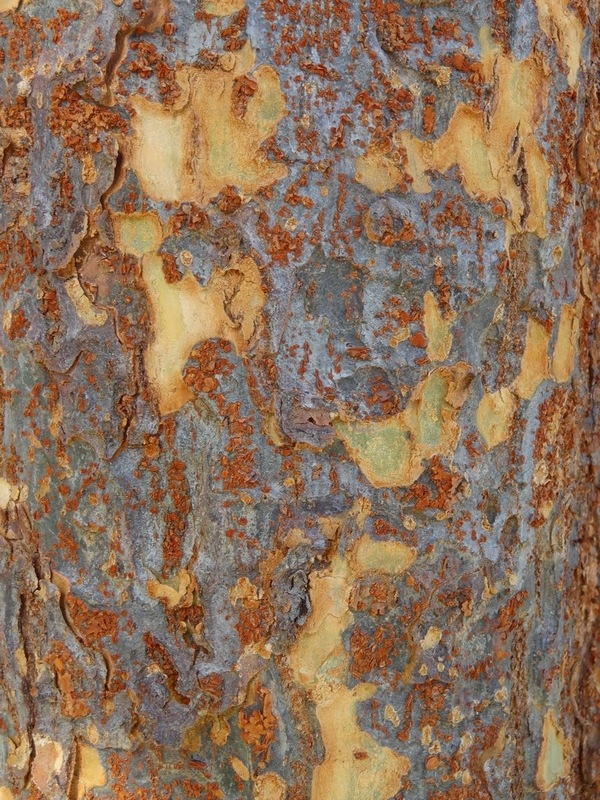 Pinus mugo 'Mr. Wood' was another one of his gifts. 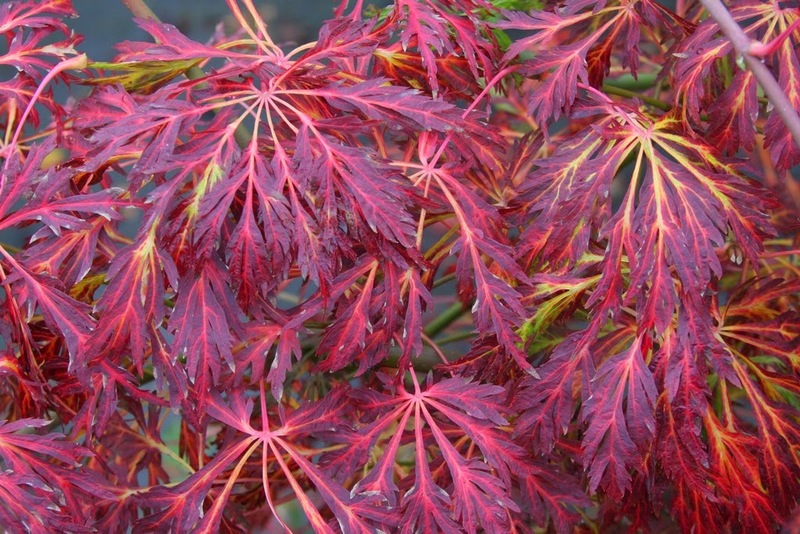 As usual we've sold out of Acer palmatum 'Ilarian', and I wonder why we didn't produce more. In my experience it is similar to 'Oridono nishiki', except 'Ilarian' is more colorful. 'Ilarian' was a seedling found by Ilarion Garfias who was employed here in the summer during high school. He was a bright happy boy who quickly made friends with everyone. I remember the day he found the seedling and proudly held it out to me. I gave congratulations and made the comment that if it was a worthy selection I would name it 'Ilarian'. It was and I did, but note that his name – Ilarian – is spelled with an "o," not an "a." So for all of those summers that he worked for me, my less-than-stellar office staff used the wrong spelling for his name on his paychecks and on all government forms. 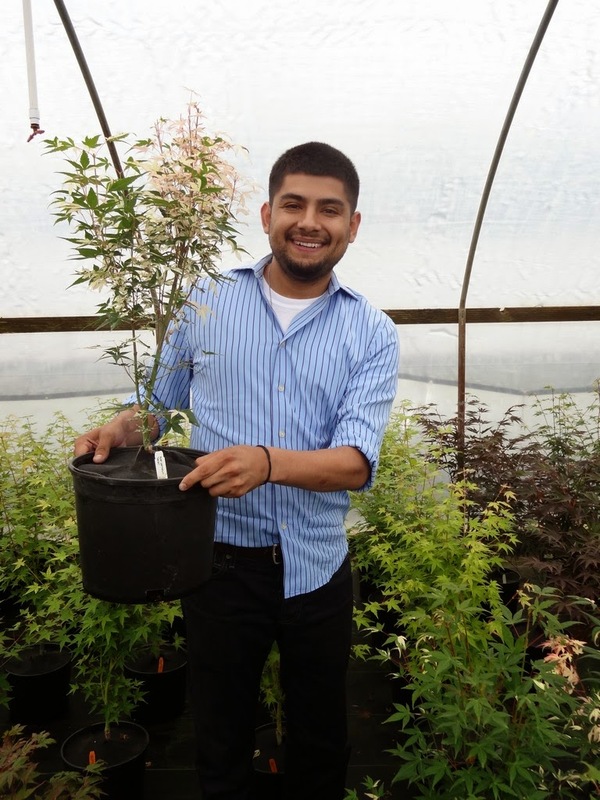 Two years ago when he came to visit at the nursery I asked why he never said anything about his name, he replied that he could still cash the paychecks and it was no big deal to him at the time. Anyway, Ilarion is in his thirties now, a college graduate who has travelled to Europe, and he is a writer who has chronicled his experiences. I guess it would be wrong of me to change the cultivar name to the correct spelling, as I have been selling 'Ilarian' for at least ten years. 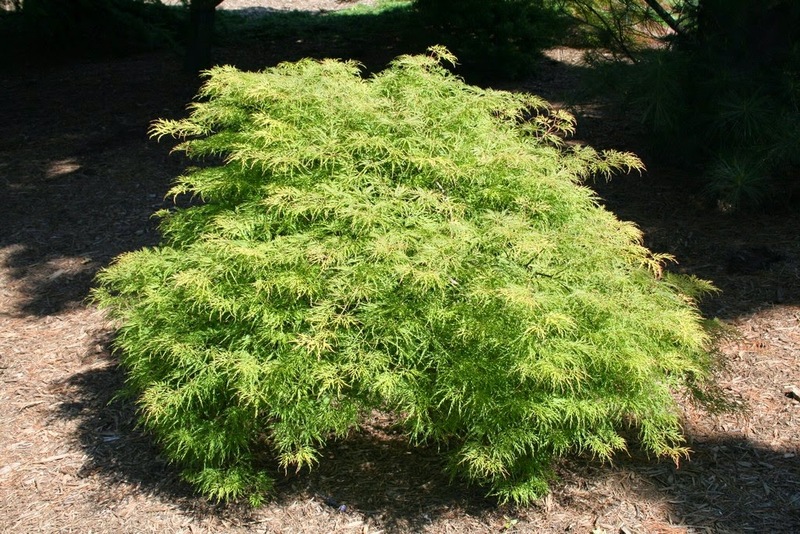 No more Acer palmatum 'Lemon Lime Lace'. This cheerful compact laceleaf has fine yellow-green leaves in spring and summer, and can be grown in full sun. 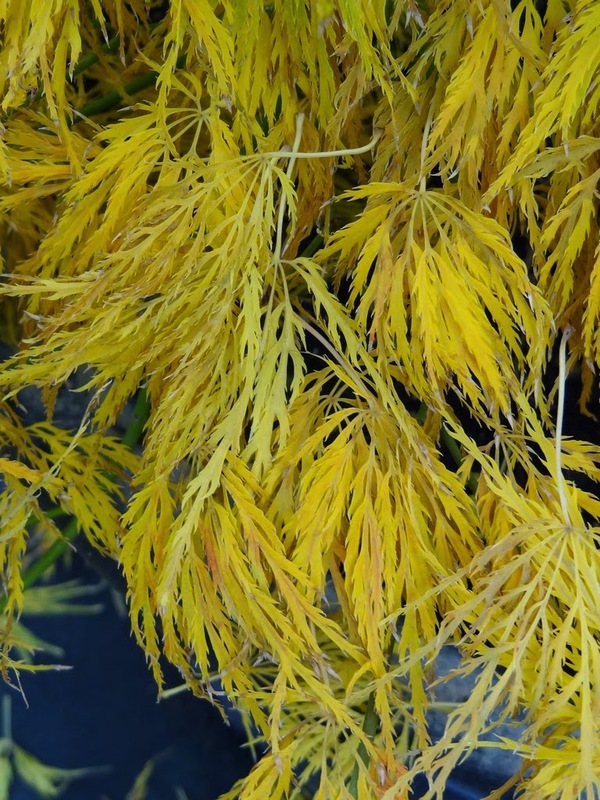 In autumn the foliage will eventually change to completely yellow, but before that you will find green and yellow at the same time, hence 'Lemon Lime Lace'. Keep in mind that the colors I describe here and elsewhere in my blogs are from my experience with the plants, at my nursery with my soil etc. 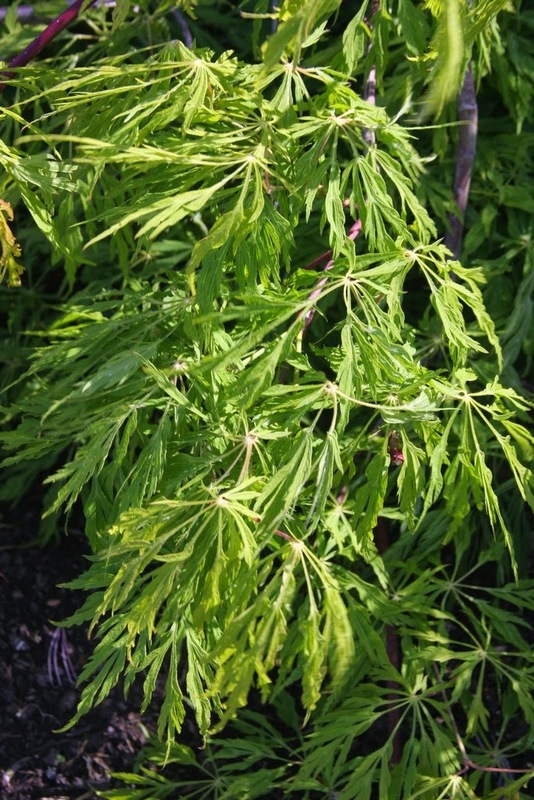 In the Vertrees/Gregory 4th edition of Japanese Maples, the color description of 'Lemon Lime Lace' is somewhat different than mine, but I would suggest that we both are correct. 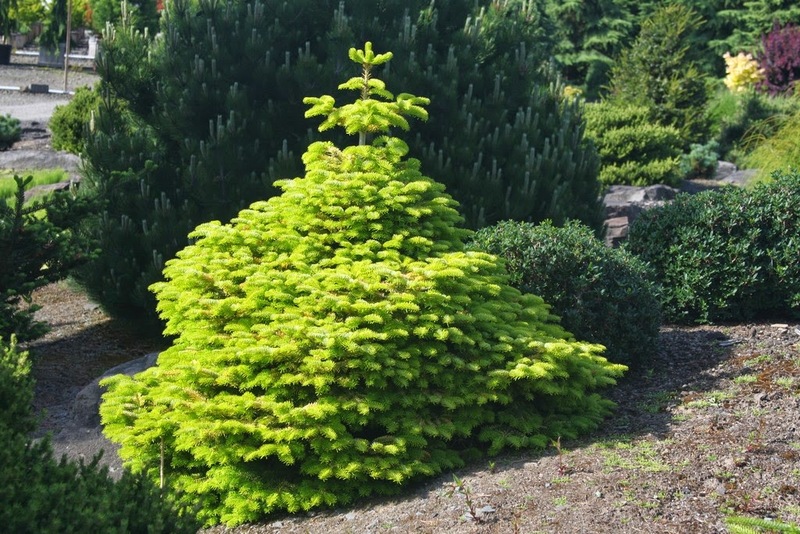 Our Abies nordmanniana 'Golden Spreader' always sells out, but they're not so profitable because they are very slow to grow. When our crop is of small size we grow them in the shade to prevent sun scald, but when one is eventually planted out (with adequate irrigation) it can handle full sun, in fact it requires a good deal of sunlight for the best golden color. 'Golden Spreader' is a garden doer, not a wimpy plant at all, but still it is very slow. I'm surprised that it was given an English name, as it originated at the Shoots Nursery in Holland before 1961. Most of the 'Golden Spreaders' I have seen in Oregon will develop a leader after about a dozen years, but if one is not wanted, it can easily be pruned out. 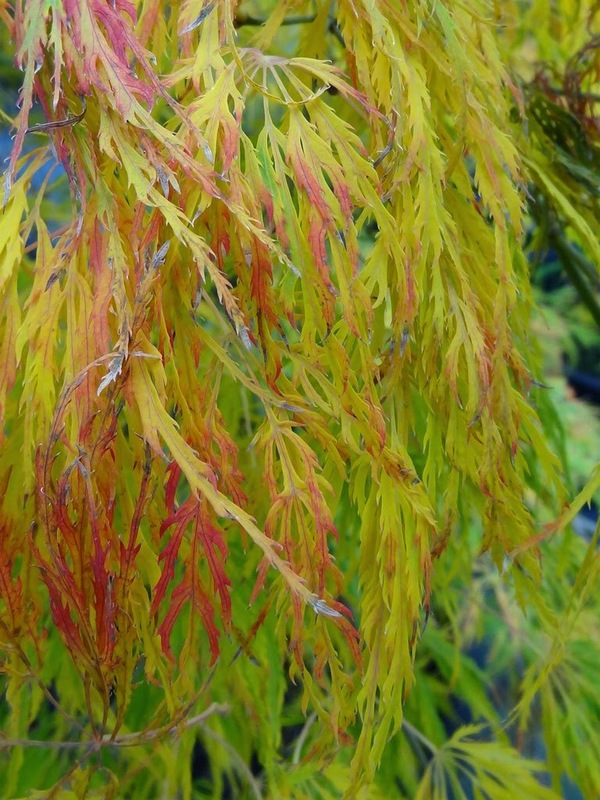 Another interesting nordmanniana is 'Pendula', but they have been more slow to sell this year compared to the past. This old cultivar has occurred a couple of times: one in England in 1847, and one in France in 1869. We didn't have many to start with, but all of the Abies koreana 'Green Carpet' are spoken for. Again we have an English name for a plant selected in Holland. It seems that the Dutch know what they are doing in horticulture, and perhaps English names are more marketable throughout Europe than Dutch names. 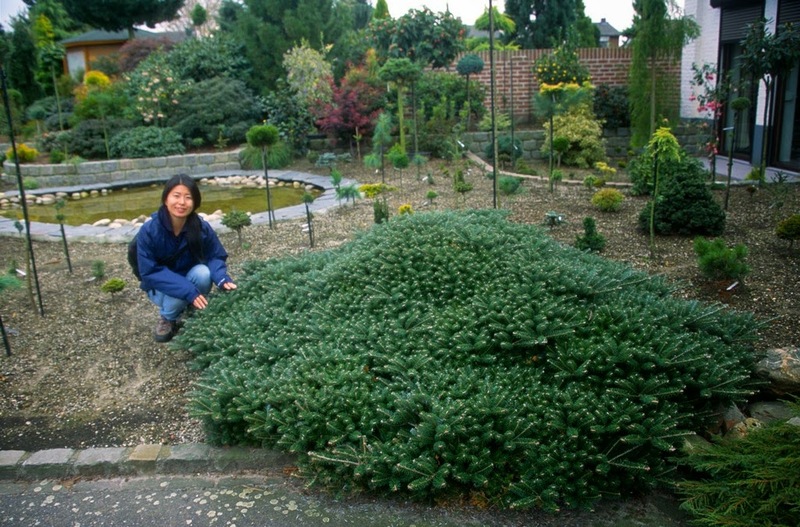 The photo above is my wife Haruko with 'Green Carpet' at the Linssen Nursery in Holland in 2002. Probably 'Green Carpet' is not an appropriate name, for as you see it does mound up with age. 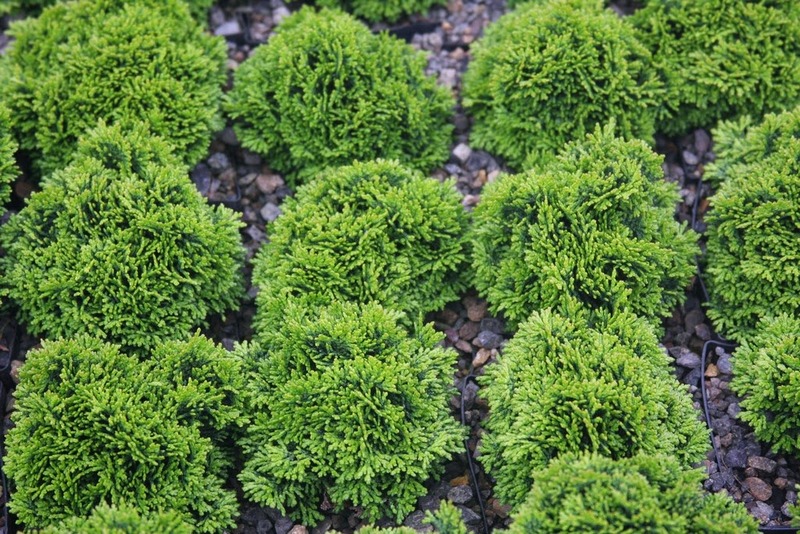 I grow 'Green Carpet' to sell, and I don't even have a mature specimen in the garden; but I'm curious, with age, if one would produce cones. Erect purple ornaments would be fun to see. 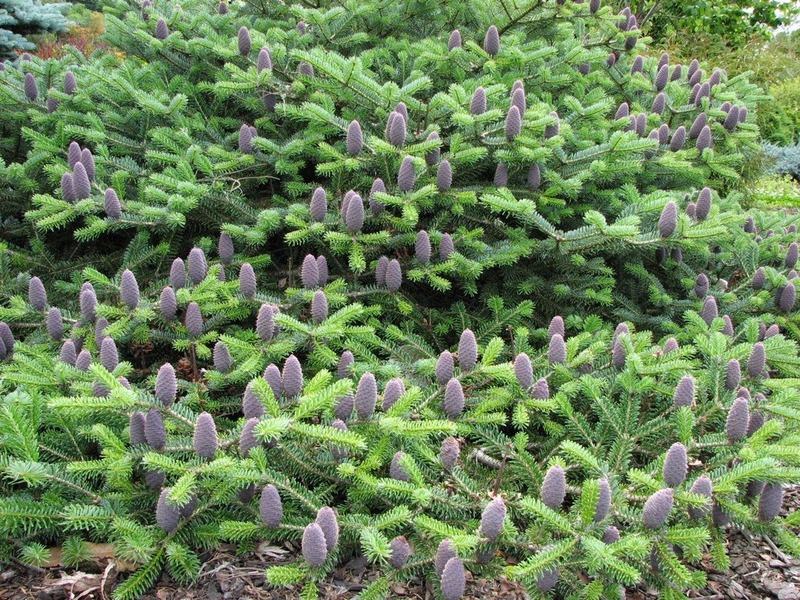 Abies x arnoldiana 'Poulsen' is similar to 'Green Carpet', and it does produce cones. 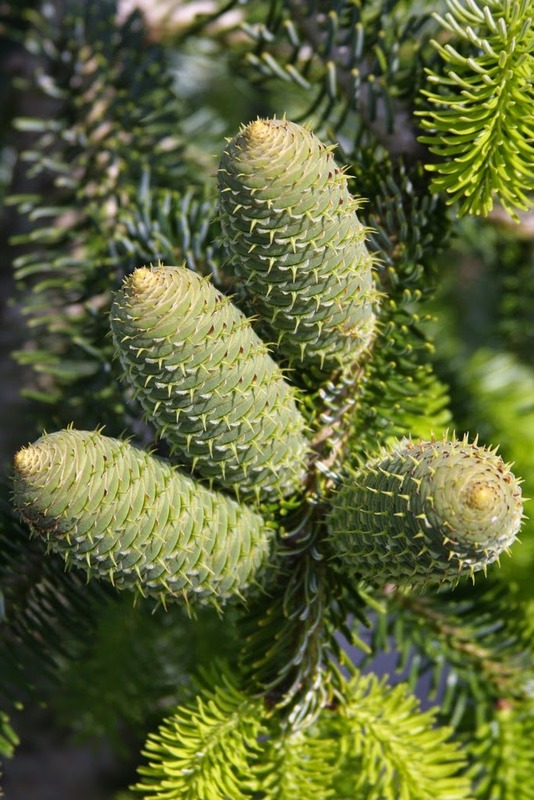 This hybrid supposedly occurred naturally between Abies koreana and Abies veitchii at the Gothenberg Botanic Garden in Sweden. 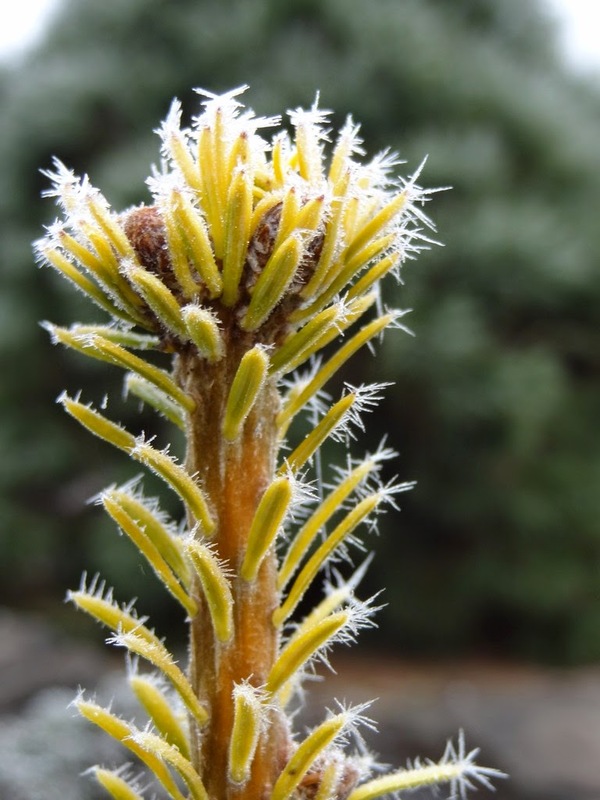 I was pleased to sell out of all Carpinus betulus 'Columnaris Nana'. They were in #10-size pots for $96 each. That's a lot of money for a 3-4' tree, but then it takes a good number of years to get to that size. 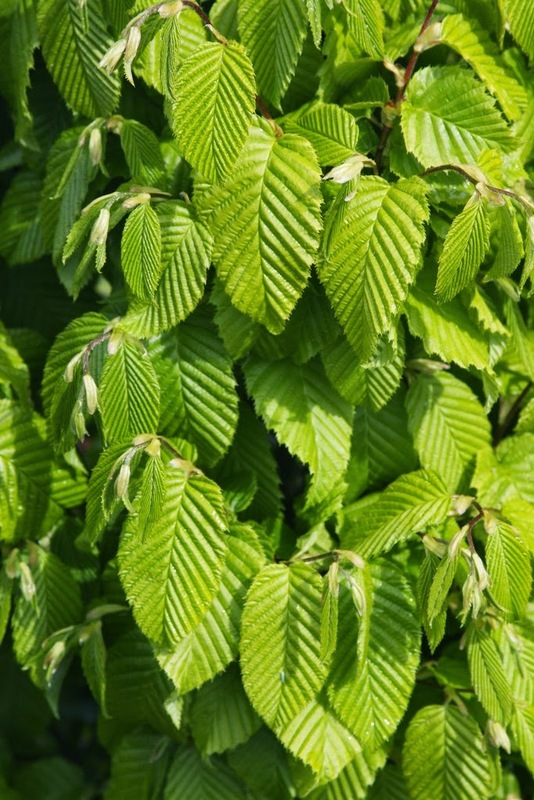 The betulus species is commonly known as "Hornbeam," "Musclewood" and "Ironwood," and the species is native to Yugoslavia. The cultivar is also known as 'Columnaris' – or used to be anyway – but at maturity it develops an oval shape with a round top. I despise old Latin names like 'Columnaris Nana' because they are so functionary, with little color to them. But that was the horticultural fashion in 1891 in Europe when Spaeth introduced it. 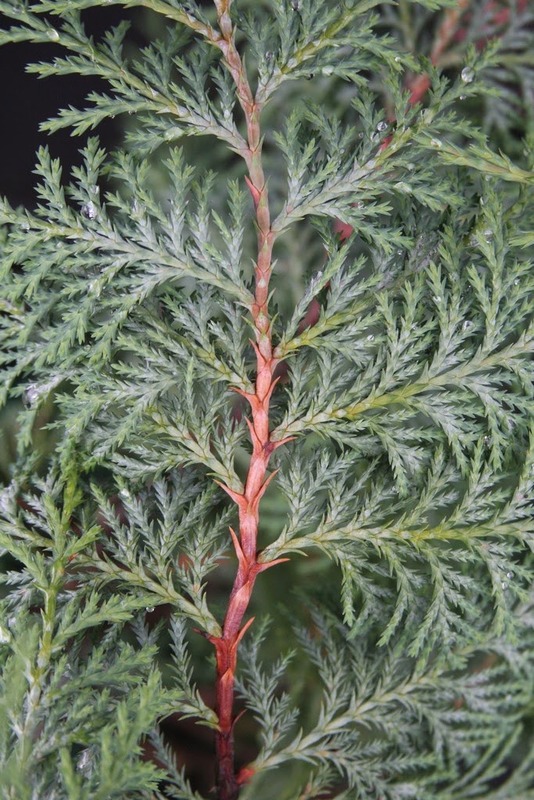 Another cultivar with a Latin name is Chamaecyparis nootkatensis 'Nidifera'. 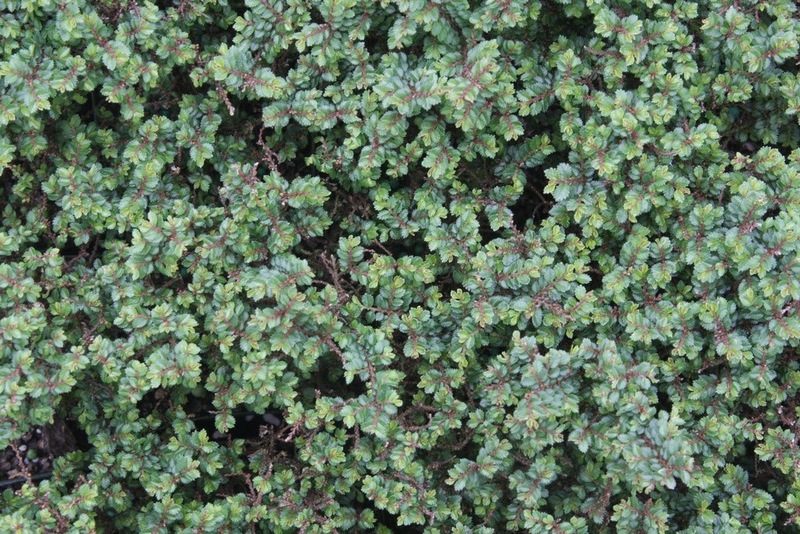 It features lacy gray-blue foliage on reddish brown stems. I had never seen it before in America, until I received a start from the Bedgebury Arboretum in England. 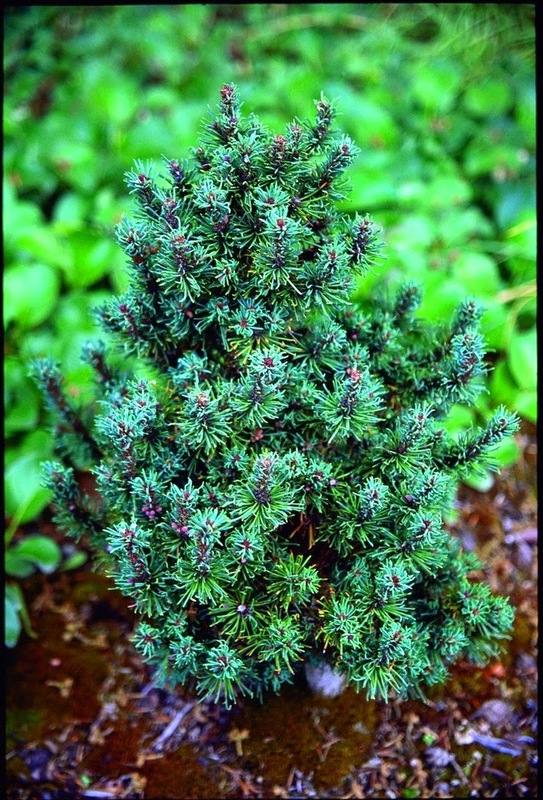 Now the Chamaecyparis genus is prohibited from Europe, but I don't know why and it is a shame. 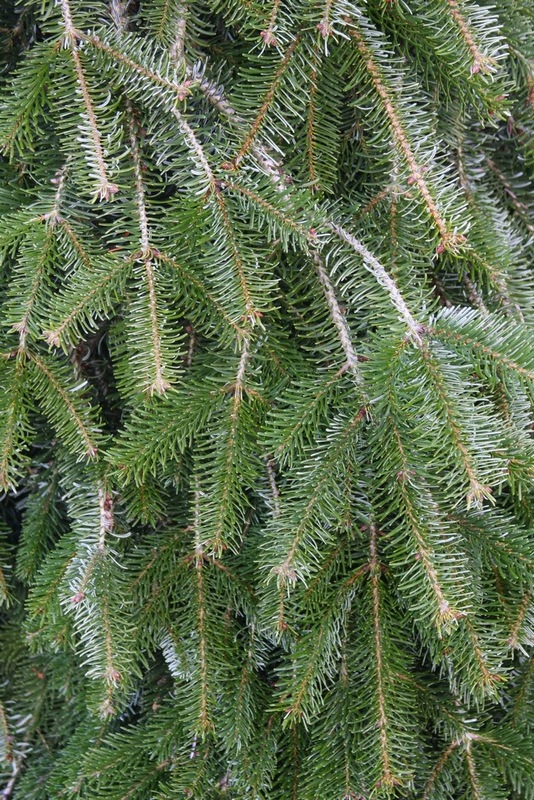 Nidifera or Nidiformis are Latin for "nest shape," and though the Chamaecyparis can be spreading, I don't detect a nest shape as with Picea abies 'Nidiformis'. 'Nidifera' was of seedling origin (from C. nootkatensis) in Italy in 1889. 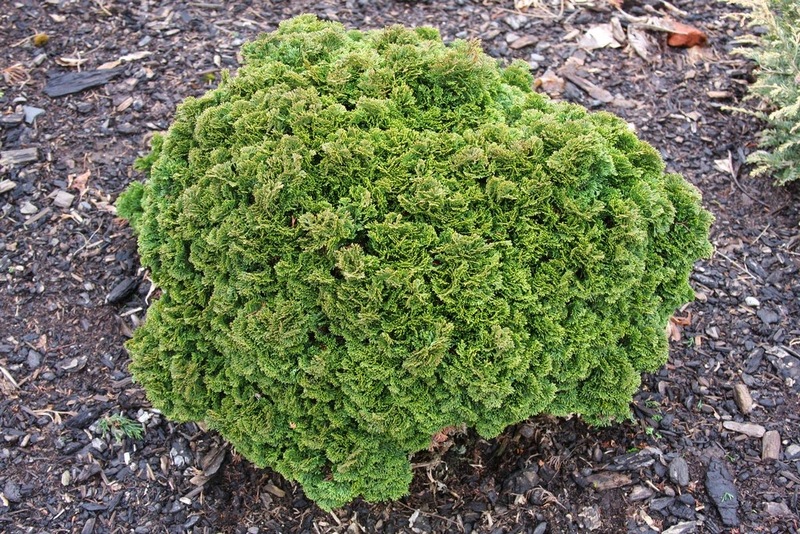 It can be propagated by rooted cuttings, or grafted onto hardy Thuja orientalis. 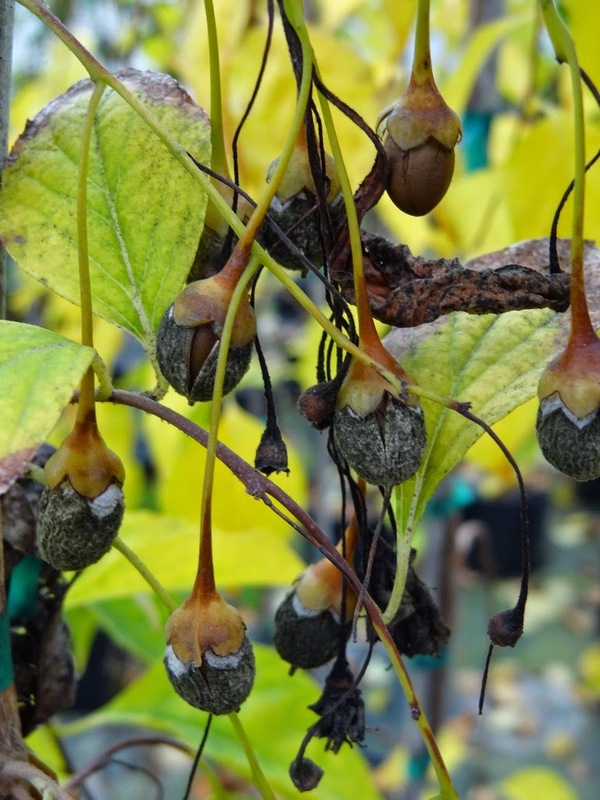 One Dutch nurseryman I know believes it is better to graft nootkatensis cultivars onto nootkatensis rootstock, the theory being that the cultivar is less likely to be cluttered with seed as the tree matures. 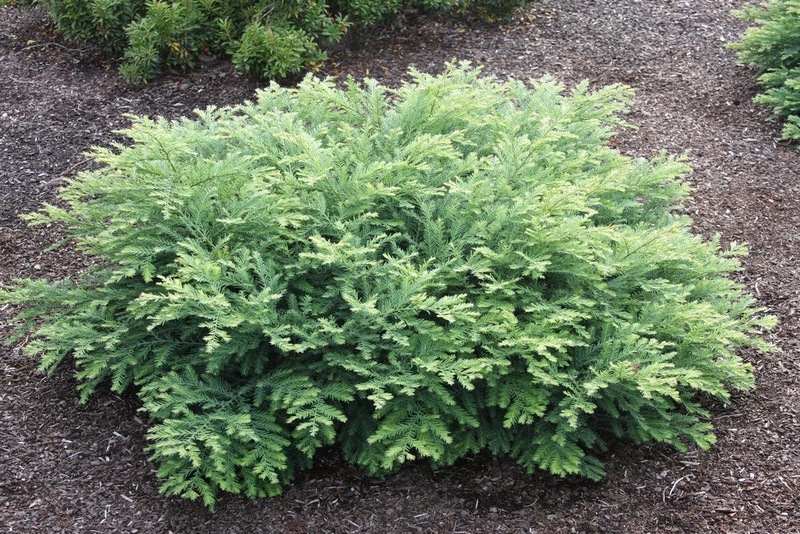 It beats me why were are all sold out of Chamaecyparis obtusa 'Leprechaun' in #1 pots, but we still have quite a number of C. o. 'Stoneham' left to sell, as the two cultivars are nearly identical. Perhaps Leprechaun sounds more cute. Both are miniature buns and these 9-10-year-old plants wholesale for only $15. A sharp business analyst would advise, "Buchholz, stop growing these little green miniatures, you're not making any money on them!" And I know that, but part of the enjoyment of horticulture is to make a good profit on some items, then to squander some of it on plants that make you happy. There are also a number of other green miniature selections, such as 'Densa', 'Nana (True)' and 'Green Cushion', with the latter selling better than the other two; but again, they are all pretty much the same. These buns are certainly cute with their congested rich-green foliage, and they combine well with other plants, such as those that we feature in our pumice gardens and alpine troughs. 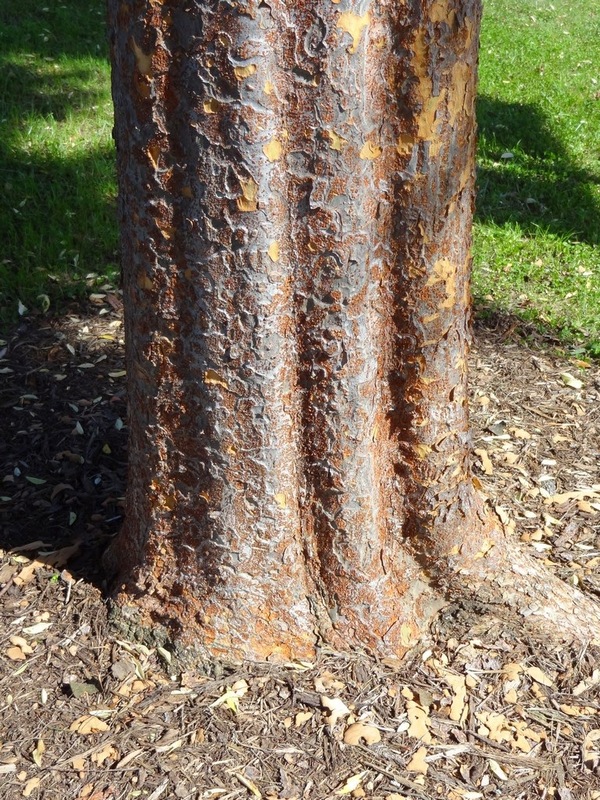 Ulmus parvifolia is known as the "Chinese Elm" or the "Lacebark Elm," and is native to China, Japan and North Korea. In the fall of 2013 I was visiting the North Carolina Arboretum, and the entrance road was lined with the cultivar 'Allee', and I was very impressed with the colorful trunks. 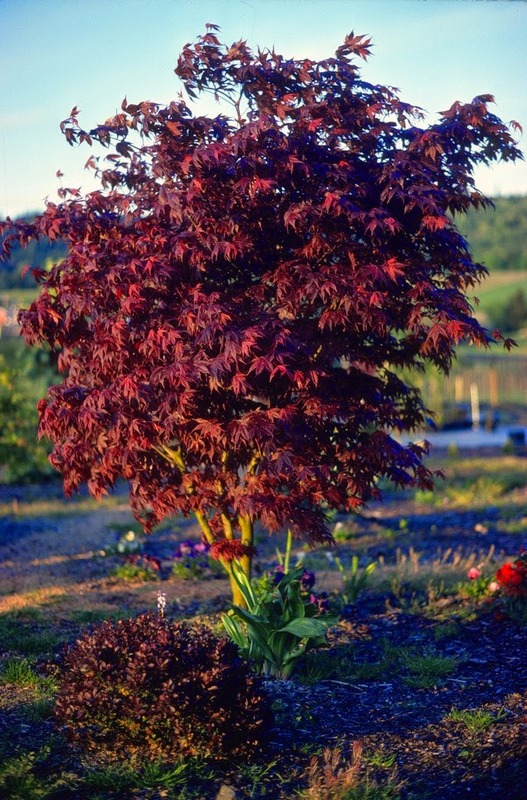 This type of shade tree is not really a "Buchholz" plant, in that I don't think I could sell any, but I wouldn't mind growing one in my arboretum. 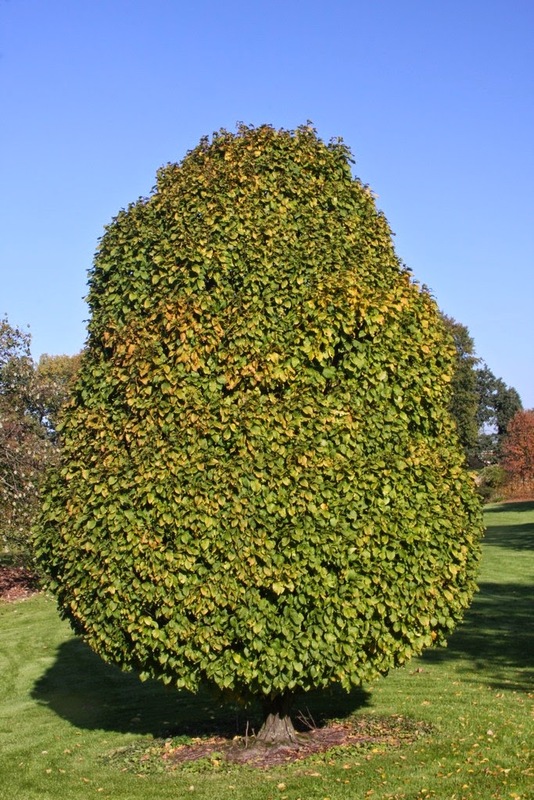 The one elm that we do grow – and can sell – is parvifolia 'Hokkaido', a miniature that requires about ten years to reach the size of a basketball. We sold out of all of our #1 size pots, and customers must have thought it was quite a deal for only $14 each. Just as with our miniature Chamaecyparis, I can sell them, but I don't if I ever make a profit. 'Hokkaido' is of Japanese origin and is sometimes referred to as the "Princess Elm." I don't know any more about its origin, whether discovered as a branch mutation or as a seedling. 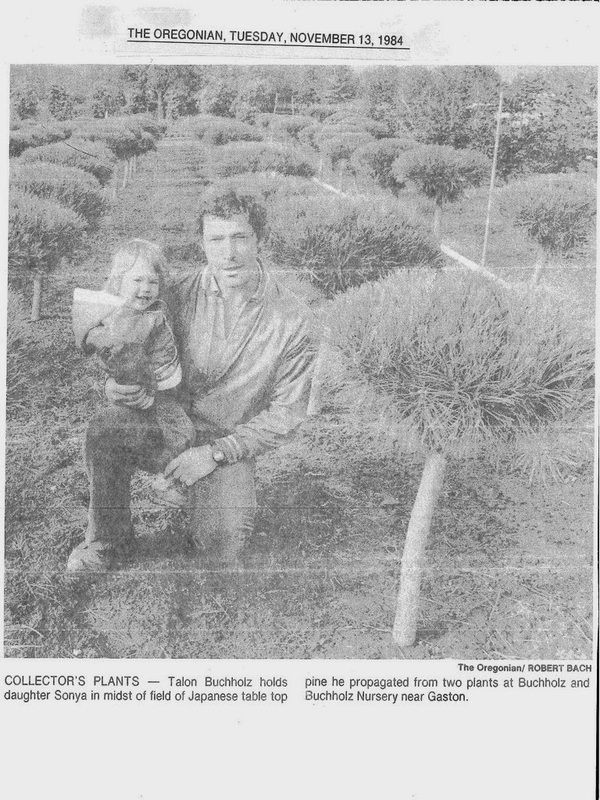 It was around when I began my career, and I've continued to grow it for over thirty years. 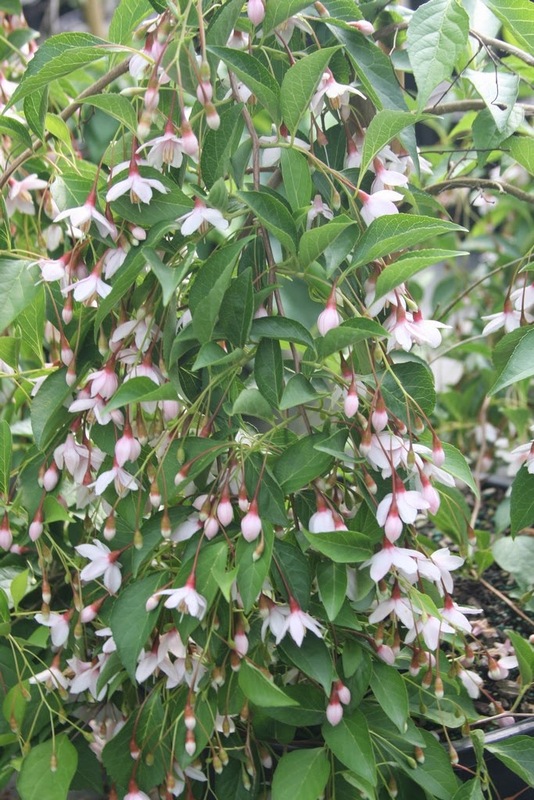 About ten years ago I received plants from Japan of a weeping Styrax japonicus, labelled 'Pink Pendula'. That can't be a valid name, even more because Japan is not inclined to use the English pink and combine it with the Latin pendula. My experience with the sender is that he was trying to help with the name translation by putting it into western terminology, but I would rather just have the Japanese name. I saw specimens in Japan that were trained to ten feet tall, and they drooped down into a full narrow form. 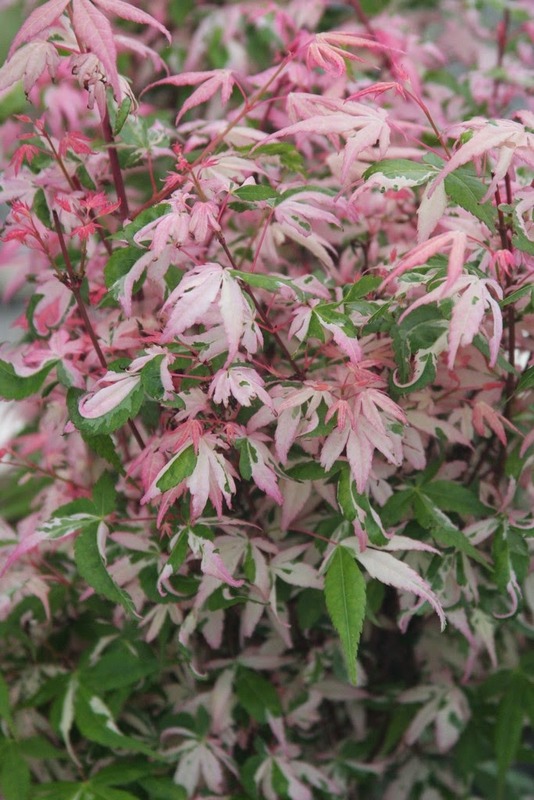 Eventually I called my stock 'Momo shidare', a Japanese name that means "pink pendula." Later I sold all of my stock plants to a propagation nursery, but after I had sold a number of 'Momo shidare'. This grower patented the plant – which should not have been done – and he renamed it 'Marley's Pink Parasol'. Confused? Not knowing what else to do, I listed my crop under the new name, and I now refrain from propagating it. 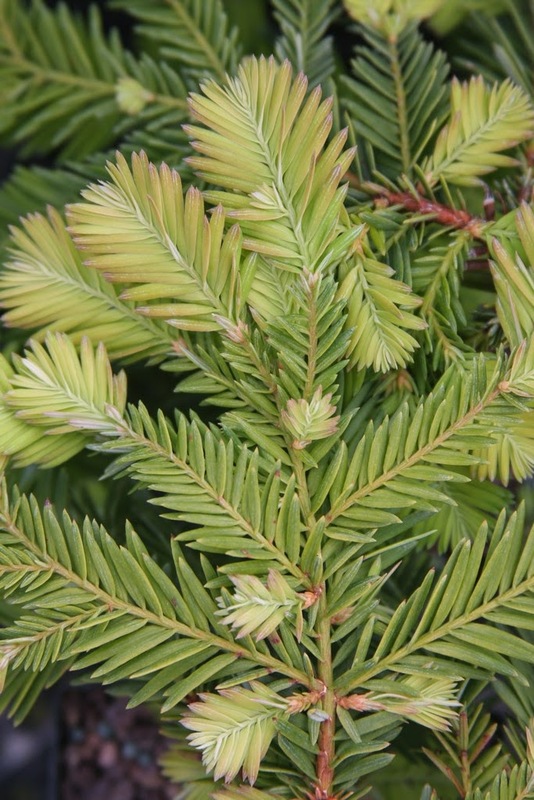 I'll mention one last plant that sold out: Sequoia sempervirens 'Kelly's Prostrate'. * The species is known as the "Coast Redwood," and it grows as the tallest tree on earth, but 'Kelly's Prostrate' is a low spreader. Our largest plants make a wonderful groundcover. 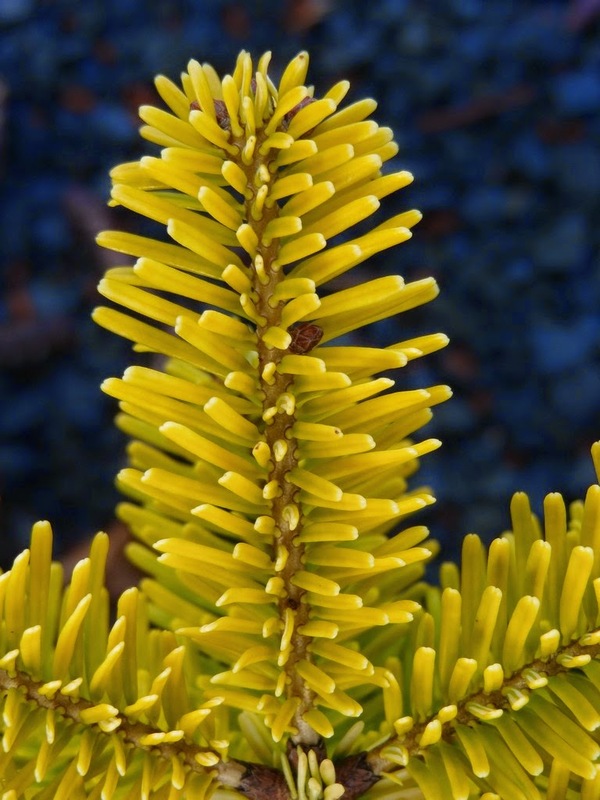 According to the American Conifer Society's website the cultivar originated as a seedling, and that "Of the many specimens known to exist, none have ever shown to produce a leader." Specimens in my garden are about two feet tall by ten feet wide, so I wouldn't call them "dwarf," as the ACS does. A few years ago I grafted some on six-foot standards. Three or four years later they started to produce leaders (which we pruned out). I didn't think that leaders would result, but I wasn't too surprised when they did, as I have seen the same with other prostrate conifers. We occasionally stake 'Kelly's Prostrate', and they make attractive little weeping specimens. These are sold when about three feet tall, but I wonder if they'll eventually form leaders once you have them started growing upward. *I once employed a woman who flustered easily, and some plant names gave her fits. On more than one occasion she referred to 'Kelly's Prostrate' as "Kelly's Prostate." I don't want to give the impression that sales are absolutely fantastic at Buchholz Nursery, for we have quite a few plants still to sell for this fall and next spring. Sales are good, but not fantastic. Perhaps in a future blog I should discuss the wonderful plants that are still for sale.